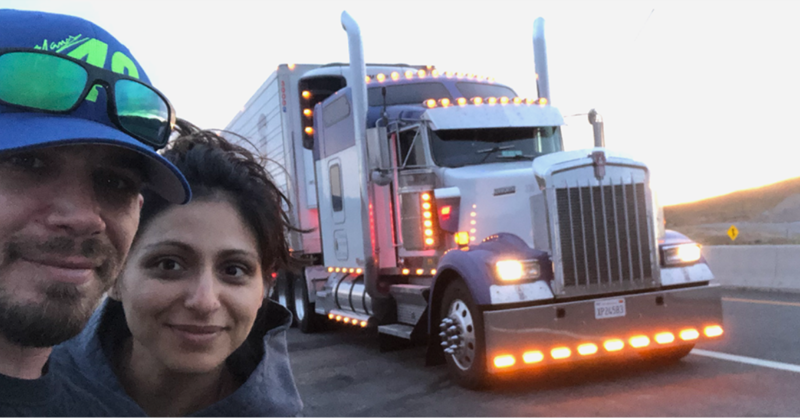 This story comes from our partners at TruckersEdge, where you can get the most loads at the best rates and get 30 days free. When I married my husband Will in 2002, I thought we’d be an active duty military family for at least 20 years, but that didn’t happen. Life had other plans for us. After four years of being a navy wife, we moved our family back to my home state and settled back in as best as we could to civilian life. In 2013, Will first mentioned going into trucking. I knew next to nothing about the trucking industry. Even though he’s not home as much as our family would like, at least trucking would mean we wouldn’t need to worry about deployment. We deal with his extended absences the best we can. The only things I’ve known about his job over the years primarily came from our conversations, and to be honest, I’ve developed a few preconceived notions. I finally got the opportunity to take an overnight trip with him in his truck in June, and I will admit that my ideas of what his life was like were wrong. I used to think that his job was more of a fun road trip, but I quickly learned that this was completely wrong. As a family, we had our fair share of fun and not-so-fun road trips, but this was neither. The moment I got into the truck, Will hooked up the trailer and I saw the shift in him. The second thing that I realized was how draining and exhausting an extended wait at a shipper or receiver can be. When we were on the road, we ended up waiting at a shipper for four hours. There was no restroom, no napping, and no food. I instantly thought back to all the times I had been less than understanding. I could see the frustration on his face as he kept looking at his drive clock, confirming that he would not be able to make that particular delivery on time. There were many nights when Will called to say a quick goodnight, mentioning that he was too tired to even shower. I’d jokingly call him lazy because in my mind I wondered, how hard can it be to just go and shower? When we were on the road, I learned a hard lesson about the challenges of being able to shower comfortably while on the road. The water might not be warm enough, it can sometimes get crowded, or there might not be any shower facilities at all. It wasn’t as simple or relaxing as jumping in the shower at home. I often pictured Will on the road, driving in quiet solitude, escaping “real life.” This is probably the number one thing I envied about his job, since I’m at home with our four kids 90 percent of the time. On the day we were heading home, I noticed several drivers sitting in their trucks alone, eating their lunch alone, and driving alone. I started to imagine how lonely it could get after more than just a few days, or how hard it would be to be away from loved ones. There are days when drivers probably feel the heartache of their extended absences — sad that their kids are growing up too fast or that life is happening without them. I’m sure there are probably days when they just want someone to talk to and not be alone. I had only been away for 24 hours, and I was already homesick and missed our girls. This trip was long overdue, and while it was far from being my favorite thing we’d ever done together, in the end, I got a first-hand glimpse into what it’s like to be on the road. I experienced the frustrations, the waiting, the boredom, the loneliness, but also the freedom of the open road, the beauty of the changing landscape, and the satisfaction of a job well done. Until this trip, I thought my job as a stay-at-home mom was harder than his. I used to think his job was so easy. I still don’t understand why he chose this profession, but through this trip I saw his passion, resilience, and hard work shine through. I’m glad I gained a better understanding of his role as a driver. Because of it, I’ve become a lot more appreciative and compassionate.